There is more information available on this subject at Earth on the English Wikipedia. "The cradle of humanity - a world of ancient glory, waiting to be retaken." Earth is the homeworld of the human species and is one of four terrestrial planets in the Solar System. It is also a living consciousness, and one of the Nine. "Once our cities lit the whole world. Now we huddle under the shadow of the Traveler, in the last place it protects. It is so very fragile, this small blue ship, our home"
In the wake of the Collapse, most of the planet's surface lies in ruins except for the Last City, which was built beneath the Traveler's protective aura. Earth is continuously threatened by various alien species who seek to claim it for their own ends. 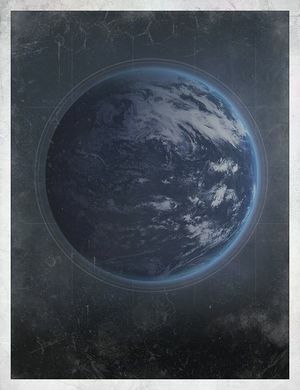 With the help of the Traveler's Light, the Guardians fight to protect humanity's home and retake its lost lands. In the pre-Golden Age time, Earth had begun to suffer from overpopulation, and had become overcrowded. Areas of the planet were occupied by the Red Legion during the Red War. The ruins of Old Chicago. The Traveler over the City.